A Shokado Bento set of kaiseki dishes (that originated from the Japanese tea ceremony). 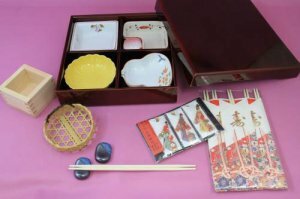 In addition to the traditional shunkei lacquer ware bento box and serving dish, we offer the best selection of wooden box sake cups essential to Japanese cuisine, complimentary chopsticks and other accessories. A buyer can choose a combination of attached small serving dishes.